If you were to believe the ads that are everywhere around this time of year, you’d think every woman wanted a European-style charm bracelet with the following “unique” and “personal” items on it: flip flops, a crystal birthstone, a ladybug, the Eiffel Tower, and a purse. I’ve never in my life wanted a flip-flop or a purse on a bracelet. Although the idea behind these bracelets is cool (create a custom bracelet and get a new bead for each holiday/big occasion in your life) I just haven’t found beads that represent me. As usual, ThinkGeek has come to the rescue. 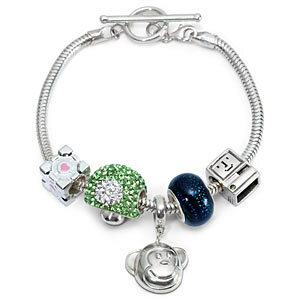 They’ve released their own charm bracelet that includes things like Timmy, a companion cube, a computer, and a “bling mushroom.” I wouldn’t be surprised to see them releasing new beads further down the road as well. The bracelet itself is $39.99 and the beads range from $12.99-29.99 at ThinkGeek.com. It’ll make a fantastic gift for all of the geeky ladies in your life! Tara + Team Hypercube FTW! It is so posh and elegant! It isn’t easy to find classy and geeky couture but this is a prize. XO!